Figure 1. Diagrams of a bypass turbojet engine, (a) Rear placement of fan, (b) forward placement of fan, (c) combustion of additional fuel in bypass duct, (d) combustion in common mixing chamber. (1) fan (compressor) of bypass duct, (2) and (2’) low-pressure compressor and turbine, (3) and (3’) high-pressure compressor and turbine, (4) combustion chamber of primary duct, (5) combustion chamber of bypass duct, (6) burners for additional fuel, (7) and (7’) jet nozzle for primary and bypass ducts. 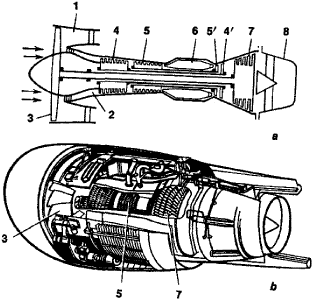 in 1953 for a bypass turbojet engine with a twin rotating primary airflow compressor (that is, a compressor having inner and outer rotors), in which one of two contrarotating rotors (the outside one) carries the working blades of the bypass duct fan. 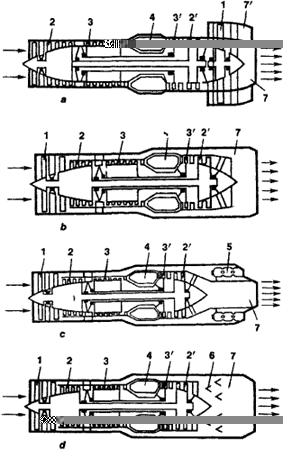 The thrust of the bypass turbojet engine is composed of the forces of reaction of the air streams and the products of combustion, which have been accelerated in the primary and secondary airflows and flow out through two independent jet nozzles (Figure 1, a and c) or one common nozzle (Figure 1, b and d). The bypass duct is a ring-shaped channel with a fan or compressor located in it behind a turbocompressor (Figure 1 , a) or in front of it (Figure l, c). Forward placement of the fan permits its use to compress the air entering the primary duct. Engines in which the bypass ratio (the ratio of the air discharged through the secondary and primary ducts) is greater than 1 are generally called turbofan engines. The bypass ratio of various types of bypass turbojet engines varies from 0.5 to 8. The degree of increase in air pressure varies from 10 to 26 in the primary duct compressor and from 1.5 to 2.5 in the bypass compressor. An increase in the temperature of the gas in front of the turbine radically improves the engine’s performance; in modern engines the temperature reaches 1600° K. The rotor of a bypass turbojet engine may have two shafts, and sometimes even three (Figure 2), with each shaft rotating at a different speed. The main feature of a bypass turbojet engine is that, for an equal expenditure of energy, a lesser acceleration is imparted to a’ considerably larger mass of air than in a conventional turbojet engine. Because of this, the thrust at takeoff and in subsonic flight is increased, and the unit consumption of fuel is decreased. Engines with a bypass ratio of 1 have 25 percent more takeoff thrust than turbojet engines, with the same thrust at a speed of 1,000 km/hr and considerably less noise from the exhaust jet, because of its lower speed. Bypass turbojet engines are widely used in the USSR and abroad in subsonic, largely passenger, airplanes (such as the 11–62, Tu-134, and Boeing 727), and in airplanes with vertical takeoff or short takeoff and landing ability. When the flight speed increases to more than 1,000 km/hr, the thrust of a bypass turbojet engine decreases sharply because of the low speed of the exhaust jet. To increase this speed, additional fuel is burned in the bypass duct (Figure l, c) or in a common mixing chamber (Figure l, d). This makes possible the use of bypass turbojet engines in supersonic airplanes, as well. Stechkin, B. S. Teoriia reaktivnykh dvigatelei. Moscow, 1958. Kliachkin, A. L. Teoriia vozdushno-reaktivnykh dvigatelei. Moscow, 1969. High Speed Aerodynamics and Jet Propulsion, vol. 12. London, 1959.